I discovered Adium many years ago and loved it instantly. Instead of having MSN Messenger, Yahoo Messenger, iChat and Facebook windows all over the place, it allowed me to combine all of it in one single app. That’s the main reason I used it and could care less about skins, sounds, icons and plugins. This was also long before I became concerned with privacy and security, I didn’t think about the fact that the MSN, Yahoo, Facebook and iChat servers were all located abroad and did not know about governments and agencies spying on us. Now I know better. I’ve spent a long time looking for good ways to secure my communications and never thought to look at the tools I already had. Then I accidentally stumbled onto Adium’s OTR encryption feature and have been using it ever since. OTR stands for Off-the-Record and is a cryptographic protocol that provides strong encryption for instant messaging (IM) conversations. OTR uses a combination of different encryption algorithms, perfect forward secrecy (PFS) and deniable encryption. Sounds good right? It is. And thanks to Adium you have this encryption right at your fingertips. OTR is not limited to Adium, other clients use it too but for OS X I’ve found Adium to be the best (and almost only) available option. There is a lot of material out there that allows you to learn more about OTR and it’s really interesting. Next, while still in Preferences, click on Advanced and find ‘Encryption’. Here you can see the private keys that are generated for each account you have set up, your fingerprint for that account and saved fingerprints for buddies you have previously verified and had encrypted chats with. If you feel at any time that your account, computer, internet connection or the identity of the other party was compromised, use the ‘Regenerate’ button to create a brand new key/fingerprint. Or even if everything is OK you can create a new key just for piece of mind. Keep in mind that every time a new key is generated you have to somehow get this key to the receiver so they can verify your identity and that increases the risk of the key being intercepted. I was told that while opinions on regenerating the key differ, to just keep one key for a long time is best for now. Make your way back to the Accounts tab and double-click on each account. One of the tabs in the window that opens is ‘Privacy’ and in there you can set OTR preferences. You can set one or more of your accounts to “Encrypt chats automatically”. What this will do is add an invisible string to your unencrypted messages which other OTR capable clients will respond to so if you are messaging to another OTR capable client, encryption will be enabled and if the other party is not OTR capable the string will be ignored and the chat session will proceed unencrypted. The OTR preferences can be set for every individual account. Open a chat window and you’ll see the lock icon at the top. Click this and select “Initiate Encrypted OTR Chat”. 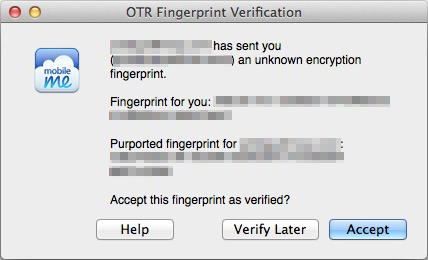 Both you and the receiver will now see a pop-up message asking to verify each others fingerprints. Instead of just clicking “Accept”, contact the other party to verify this fingerprint! Be smart when contacting the other party to verify their fingerprint. For example phone conversations are monitored by every government around the planet so this is not considered secure. Best is to write fingerprints down and exchange them in person. If that is not an option be creative but careful, you do not want your key intercepted. As mentioned, your key and the keys of users you have already verified are stored in Adium’s preferences so it is important to keep anyone other than yourself away from those preferences. Use a login password, full disk encryption like FileVault and a screensaver password so that these keys can not be compromised while you are away from your keyboard. If your key/fingerprint is compromised at some point then future messages could be at risk but messages sent and received in the past can not be decrypted using this key. This is, in my opinion, one of the biggest advantages over PGP encryption or applications such as Cryptocat where years of messages can be decrypted if the key falls into the wrong hands or a flaw is discovered. Anyway, that’s all there is to it! A quick setup and one button. All it takes to have some privacy and, if need be, deniability for your chat and messaging sessions. 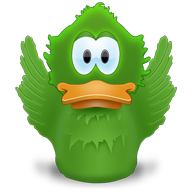 – It uses OS X’s File Quarantine feature so any files transferred through Adium will be flagged for extra security. – Resource usage is very low, some of the lowest i’ve seen in any chat or messaging application. – Adium is completely free. – OTR in Adium will be improving with the addition of the Socialist Millionaire protocol allowing for authentication via a shared secret rather than a fingerprint. I’ll write a follow-up post about that once the feature has been released. Thanks for sharing the guide! want to…HaHa). You certainly put a new spin on a topic that has been discussed for many years. So it can fill your buddy list with actual names instead of email addresses. You are not obligated to allow the access, it is just a lot more convenient for you. No OTR preferences on Facebook, just Account, Personal and Proxy? I have deleted my Facebook a while ago so I can not test this but if I remember correctly you have to set up the Facebook account as a XMPP instead of Facebook, then OTR becomes available. As a genuine novice, I enjoyed your article…actually understood much of what you said. I went to the Socialist Millionaire link and I’m sure those guys really understand all those formulas but they sure do not know how to bring all that down to the novice level. You mentioned you planned a followup article. Was that done? If so, how can I reach it? The follow up has not been written (yet). The feature that I was told would be making it’s way to Adium has still not been introduced. I check out their beta’s and nightly builds regularly but so far nothing yet. I use Adium every day so once the Socialist Millionaire protocol is present I’ll write about it right away. Thanks Jay. I’m sorry that I failed to say in my email just how informative and thorough your article was. I want to learn all I can about how to intelligently shield myself from any kind of intrusions. It’s a slow process for me at my age (75) but I’m hopeful. I’ll be looking for your update. Merry Christmas to you! And you too! 🙂 If there’s ever a certain topic you want to know more about just let me know. If I haven’t covered it yet and if it’s relevant to other readers I’d be happy to write about it.